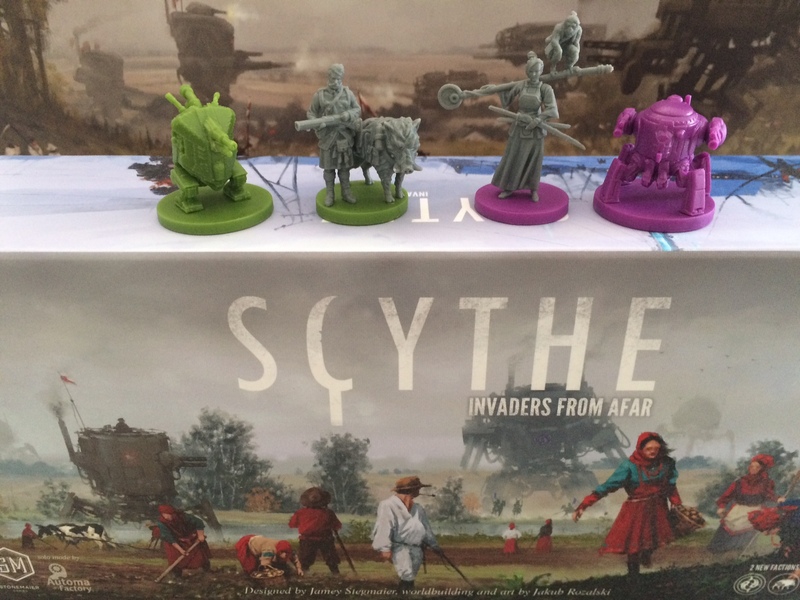 This expansion for Scythe adds 2 news factions (Albion and Togawa) and the ability to play with up to 6 or 7 players. Download the Invaders from Afar rulebook (many languages available) or download the extended achievement sheet (created by Rick Goodrow). While empires rise and fall in Eastern Europa, the rest of the world takes notice. Two distant factions, Albion and Togawa, send emissaries to scout the land and employ their own distinct styles of conquering. Invaders from Afar will be available in November 2016 with an MSRP of $30. You can request it from your preferred retailer (stock code STM615). We’ll post teasers on BGG and the Scythe Facebook group. Why don’t the expansion factions have power dials? It’s a matter of coherency and consistency. 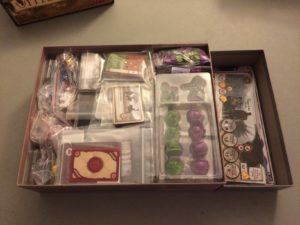 The Scythe expansion is a retail product that is compatible with any version of Scythe, but as a retail product, it needs to be cohesive and consistent with the retail core game. If a retail customer opens an expansion box to discover 2 new power dials, they might wonder if they should have gotten 5 in the original game. 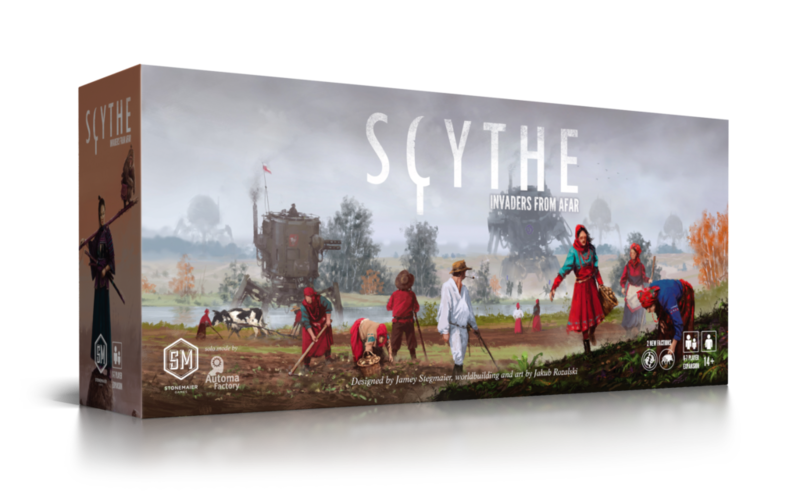 While I highly, highly value our backers, in the long run, the majority of people who own Scythe will have the retail version, so consistency with that version is the long tail. When considering things like this, we also look necessity and impact on price. Only 2 dials are ever needed in any game of Scythe. It’s not like combats are happening so quickly that you don’t have time to pass the dial to your neighbor. It’s nothing more than a nice bonus to have extra dials, hence how it’s ripe for a promo product. Also, more dials equals higher cost, and higher cost equals higher price. Adding the dials would increase the price of the expansion from $30 to $35, and we don’t think it’s fair to charge all people for something only some people want. The dials will be available as promos in 2017. Is the expansion compatible with my special Kickstarter edition of Scythe? Of course! Everything you have in your special KS edition already covers what you need to play the expansion (coins, resources, power dials, etc.). We’re making expansion-themed coins and power dials for sale in early 2017, but they’re ancillary, not necessary. Help! Why are my Albion mechs broken? Is the expansion available in other languages? Yes! All of our international partners for Scythe also have the expansion. Can I place a Trap or Flag on the Factory? Yes (consistent with other rules about Trap and Flag placement, of course).